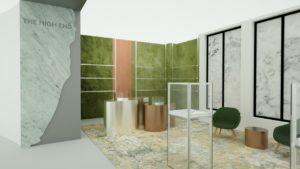 “Barneys New York has always been at the forefront of shifts in culture and lifestyle, and cannabis is no exception,” said Daniella Vitale, chief executive officer and president, Barneys New York – and now cannabis retail store operator. “Many of our customers have made cannabis a part of their lifestyle, and The High End caters to their needs with extraordinary products and service they experience in every facet of Barneys New York,” she said. By all descriptions, Barneys’ cannabis retail store will be a disorientating experience even before you partake. Its luxury cannabis line includes a bong ($950 US), a cannabis grinder ($1,475 US), and Beboe THC vape pens ($75 US). The High End will also offer “rare and exclusive items” such as gold rolling papers, Lorenzi Milano lighters, leather ashtrays, and custom-blown glass pipes. Barneys is also entering “cannabis fashion” with jewellery and accessories such as grinder necklaces and pastille dispensers crafted from fine sterling silver. Barneys is not the first high-end retailer to enter the luxury cannabis market. In December 2018, Neiman Marcus became a cannabis retail store as well, stocking shelves with cannabis-based beauty products. Cannabis is legal at the state level in many states including California, which opened legalized cannabis stores for adult-use cannabis in 2018. However, cannabis remains illegal in the United States at the federal level. In a surprise move, the country legalized hemp in December 2018. Many saw that as a step towards legalizing cannabis, which could happen as early as this year. Barneys The High End is targeting Millennials and the wellness trend, offering experiences designed to enhance well-being. Given the prices at its luxury cannabis retail store, those Millennials have to be well-off, too. “As wellness brands gain market share in the overall market, retailers are both catering to consumer demand and attempting to bring more excitement to their floors to attract new consumers,” said Larissa Jensen, beauty industry analyst at The NPD Group. These early high-end cannabis retail stores could be the beginnings of a “cannabis chic” trend.